The full abstract booklet can be downloaded here (Caution 13 MB file). Updated Sunday arrival information is provided below. Please note that some venues listed in the conference booklet are subject to change as a result of a student occupation – please pay attention to local announcements. The RSC ESR Spectroscopy Group AGM will take place at this meeting (Tuesday 3.15pm, GC701 in the graduate centre), and nominations for committee members are now open. Please see the committee pages for full details. Registration for all conference participants will open on Sunday from 16:00 to 18:00 and will take place at the registration desk in the foyer of the Joseph Priestley building. This building will be signposted and can be located on the campus map. For conference attendees arriving later than this, the registration pack will be available at the Graduate Centre. On Sunday evening a barbecue dinner will follow registration (18:00 – 20:00) and will be held outside the Joseph Priestley building (weather permitting). In the event of rain, participants can take shelter in The Curve, where seating is provided. 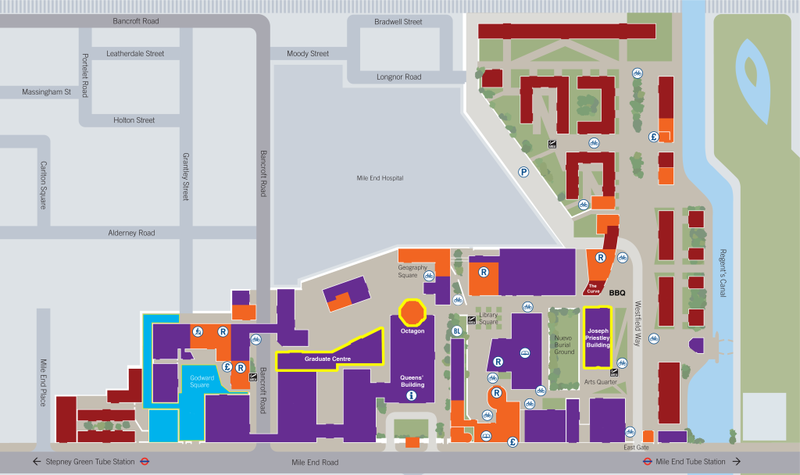 All locations are indicated on the campus map below (click image for larger version). Poster boards are A0 portrait format. Posters will be identified by their number in the conference booklet. Please affix your poster to the corresponding numbered board only, using the material provided.